The Sahara Force India VJM07 is another design signed off by Andrew Green, more and more known by his solid cars built on a limited budget. The team have invested a lot of time into this car, having decided to entirely halt development of the VJM06 halfway into the 2013 season. The VJM07 continues to be powered by a Mercedes engine but marks a switch from gearbox suppliers as the team decided to use a Mercedes gearbox instead of the McLaren gearbox that was used in the VJM06. The company's COO, Otmar Szafnauer highlighted at the car's online launch the chassis was an entirely new design, an unavoidable change due to the extensive regulation changes: "The chassis is completely new and all the systems are new." 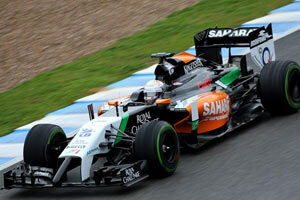 The car had its shakedown on 24 January at Silverstone with Nico Hulkenberg at the wheel. It was however 4 days later at Jerez where it made its public debut. During this entire 4-day test, the car however showed several technical issues that limited the team's running. Front suspension: Aluminium alloy uprights with carbon fibre composite wishbones, trackrod and pushrod. Inboard chassis mounted torsion springs, dampers and anti-roll bar assembly. Rear suspension: Aluminium alloy uprights with carbon fibre composite wishbones, trackrod and pullrod. Inboard gearbox mounted torsion springs, dampers and anti-roll bar assembly.